UN General Assembly amends draft of anti-hate resolution to include anti-Semitism after vigorous Israeli push. In its original version, the proposal only referred to Islamophobia, but after a diplomatic effort led by Israel's ambassador to the UN, Danny Danon, with many UN states, the proposal was changed and condemned anti-Semitism as well. 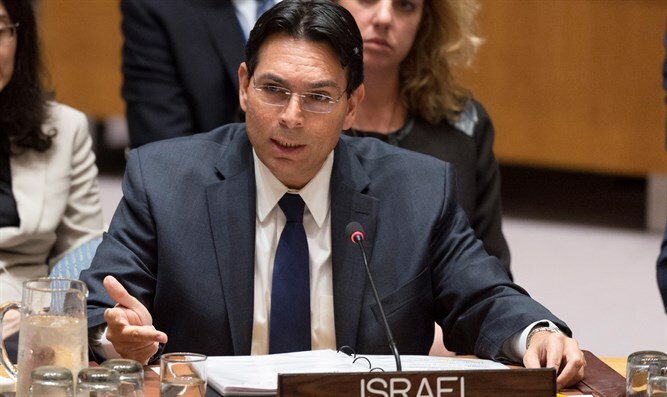 Danon said, "It seems that the memory of history is fading over time, but the diplomatic effort that we have led has shown that we will not allow the international community to remain silent while a wave of anti-Semitism spreads throughout the world." "Unfortunately, we return to the days when kippot and Stars of David are targets, including marked Jewish businesses and desecrated synagogues," added Danon. "This is an Israeli achievement at the UN and a crushing loss to the forces of hatred. However, it is very unfortunate that we should have fought to include anti-Semitism in the draft resolution. I remind the world that denying the right to self-determination of the Jewish people in its land and being anti-Israel is no different from being anti-Semitic. " "The time has come for the world to channel its power to act uncompromisingly against hatred and anti-Semitism and to stop ignoring the forces, both inside and outside the corridors of the United Nations, who seek to harm these efforts," concluded Ambassador Danon.